Want to know how reader Liatte–-a lawyer and aspiring Lego artist—made her room of necessity themed around Nintendo's iconic plumber? 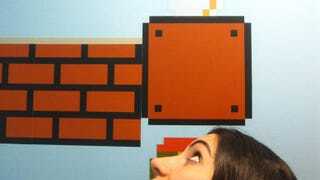 She's been kind enough to answer a few questions about her Mario tribute bathroom and how she got it that way. "The bathroom's looked like this for about 8 months. I did it entirely myself, a professional only within the confines of my imagination. The blue paint was Dunn-Edwards "Azure Sky", the Mario decals came from ThinkGeek.com, the Nintendo Controller soap flew in from Etsy.com, the towels I found on the internets, and the trashbox was made with some brown and black paint, some wood, and a Dremmel. I have been trying to figure out how to paint the toilet warp-pipe green and make this the flush sound, but alas... I am but a feeble woman. I love all Mario games equally, like my (unborn) children. If I have to narrow it down, I'd say my top 4 are Mario Kart (N64), Super Mario Brothers (NES), Dr. Mario (all platforms), and last but certainly not least, Mario Teaches Typing (without which this conversation would not be possible). I don't have roommates or a significant other, so I have the luxury of doing what I want, when I want. Though I'd imagine if someone were to share my space romantically or otherwise, they'd have similar impeccable tastes. The bathroom's been well received, so I'm fortunate enough to be hanging out with the right people."